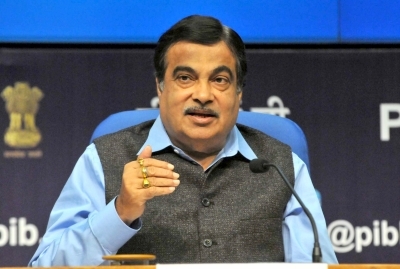 New Delhi, Oct 25 (IANS) The Centre’s Bharatmala Paroyojana will increase the number of national corridors from six to 50, double freight on national highways to around 80 per cent and help connect 200 more districts with highways, Union Minister Nitin Gadkari said on Wednesday. The ambitious Bharatmala road and highways project, which is centrally-sponsored and funded, will help to considerably improve India’s rankings in the Logistic Performance Index, the Road Transport and Highways Minister told the media here. His remarks come a day after the Union Cabinet approved an ambitious road construction and expansion programme of over 83,677 km over five years costing about Rs 6.92 lakh crore. The Bharatmala project is part of the 83,677 km road project approved on Tuesday and will generate huge direct and indirect employment in construction activity, the Minister said. “Bharatmala is the new umbrella programme for the highways sector that focuses on optimising efficiency of road traffic movement across the country by bridging critical infrastructure gaps. It will be a major driver for economic growth and help realise the Prime Minister’s vision of a ‘New India’,” Gadkari said. The project has been designed to bridge gaps in existing highways to make the movement of man and material more efficient, he said. “Bharatmala will give the country 50 national corridors, compared with six at present. Seventy to 80 per cent of freight will move along the national highways against 40 per cent at present. The programme will help connect 550 districts through national highways, compared with around 300 districts at present,” he said. Special attention has been paid to fulfil connectivity needs of backward and tribal areas, areas of economic activity, places of religious and tourist interest, border areas, coastal areas and trade routes with neighbouring countries, Gadkari said. He said its first phase includes 24,800 km of roads — economic corridors, border and coastal roads, and greenfield expressways. There will be 9,000 km of economic corridors, inter-corridor and feeder routes (6,000 km), national corridors efficiency improvement (5,000 km), border roads and international connectivity (2,000 km), coastal roads and port connectivity (2,000 km) and greenfield expressways (800 km) in the first phase. In addition, Bharatmala Phase-I also includes 10,000 km of balance road works under the National Highway Development Programme, taking the total length of roads to 34,800 km at an estimated cost of Rs 5,35,000 crore. Gadkari said the programme envisages improving the efficiency of the National Corridor (Golden Quadrilateral and North South-East West Corridor) by decongesting choke points through lane expansion, construction of ring roads, bypasses/elevated corridors and logistics parks at identified points. Around 5,000 km of national corridor will be taken up in Phase-I at an estimated cost of Rs 100,000 crore. Around 26,200 km of economic corridors, 8,000 km of inter-corridors and around 7,500 km of feeder corridors have been identified under Bharatmala. Stretches connecting more than two corridors are classified as inter-corridors routes, while other routes connecting to one or two corridors are termed as feeder corridors. Bharatmala also envisages building 3,300 km border roads and 2,000 km international connectivity roads. The Minister said apart from Rs 5,35,000 crore for Bharatmala Phase-I, there is a requirement of Rs 1,57,324 crore for ongoing projects under various schemes. Officials said that the Gross Budgetary Support for the Bharatmala project and existing schemes in five years will be restricted to Rs 2,37,024 crore from the Central Road Fund (CRF), Rs 59,973 crore as budgetary support, Rs 34,000 crore from expected monetisation through toll-operate-transfer route and Rs 46,048 crore collected as Toll-Permanent Bridge Fee Fund by the National Highway Authority of India. Around 600 projects have been identified for Bharatmala and preparation of detailed project reports for 19,500 km is underway at present.